Surface runoff, a type of nonpoint source pollution, from a farm field in Iowa during a rain storm. 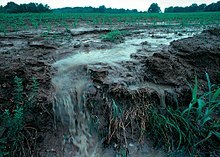 Topsoil as well as farm fertilizers and other potential pollutants run off unprotected farm fields when heavy rains occur. Topsoil is the upper, outermost layer of soil, usually the top 5 inches (13 cm) to 10 inches (25 cm). It has the highest concentration of organic matter and microorganisms and is where most of the Earth's biological soil activity occurs. Topsoil is composed of mineral particles, organic matter, water, and air. Organic matter varies in quantity on different soils. The strength of soil structure decreases with the presence of organic matter, creating weak bearing capacities. Organic matter condenses and settles in different ways under certain conditions, such as roadbeds and foundations. The structure becomes affected once the soil is dewatered. The soil's volume substantially decreases. It decomposes and suffers wind erosion. Plants generally concentrate their roots in and obtain most of their vital nutrients from this layer. Actual depth of the topsoil layer can be measured as the depth from the surface to the first densely packed soil layer known as subsoil. In soil classification systems, topsoil is known as the "O Horizon or A Horizon," therefore, it is the very top layer. Commercially available topsoil (manufactured or naturally occurring) in the United Kingdom should be classified to British Standard BS 3882 with the current version dated 2015. The standard has several classifications of topsoil with the final classification requiring material to meet certain threshold criteria such as Nutrient Content, Extractable Phytotoxic Elements, Particle Size Distribution, Organic Matter Content, Carbon:Nitrogen ratio, Electrical Conductivity, Loss on Ignition, pH, Chemical and Physical Contamination. The topsoil should be sampled in accordance with the British Standard and European Norm BS EN 12579:2013 Soil improvers and growing media - Sampling. During construction of garden areas for housing plots the topsoil should be underlain by a layer of suitably certified subsoil that conforms to the British Standard BS 8601:2013 Specification for subsoil and requirements for use. When starting a gardening project, it is crucial to check whether or not the soil is satisfactory. Different types of plants vary in their nutrient needs and preferred soil conditions, many are strongly adapted to particular conditions. However, some general guidelines for "desired levels of Topsoil nutrients" have been made, broadly suitable for many plants. The two common types of Topsoil are Bulk and Bagged Topsoil. The following table illustrates major differences between the two. Acidic, Calcareous, Low Fertility, Low Fertility Acidic and Low Fertility Calcareous. These uses are limited to specific site scenarios and acceptance should be on a case by case basis for construction projects. Topsoil is the primary resource for plants to grow and crops to thrive and the main two parameters for this are Carbon and Nitrogen. The Carbon provides energy and Nitrogen is a tissue builder and plants require them in a range of ratios to enable suitable growth. An optimum figure for Topsoil in the UK is a ratio of less than 20:1. This ensures that the soil has a suitable energy reserve as well as tissue building material to enable the plants to thrive. A sawdust typically has a carbonaceous base and this a high C:N ratio (in the order of c. 400:1) while an Alfalfa Hay has a low carbonaceous content and can typically have a C:N ratio in the order of 12:1. A variety of soil mixtures are sold commercially as topsoil, usually for use in improving gardens and lawns, e.g. container gardens, potting soil and peat. Another important yet not commonly known use for topsoil is for proper surface grading near residential buildings such as homes. "The ground around the home should slope down six inches for the first ten feet away from the home. This can often be done by adding topsoil (not sand or gravel)." Because of its use in commercial application and due to the environmental concerns regarding erosion, it is important for consumers to accurately determine how much topsoil they need for a given project. Topsoil is mainly sold by the cubic yard in the United States. To calculate the amount of topsoil you will need, "simply take your length (in feet) multiplied by your width (in feet) multiplied by your depth (in feet so if you wanted 5 inches that would be 5/12) then divide the total by 27. This will give you your cubic yards needed for the project. Ex: 10L x 10W x (5/12) = 41.66/27 = 1.54 cubic yards of topsoil needed.". ^ Marsh, William M. (2010). Landscape planning : environmental applications (5th ed.). Hoboken, NJ: Wiley. ISBN 9780470570814. ^ U.S. Department of Agriculture (USDA), Soil Survey Division Staff (1993). "Soil Survey Manual." Archived 2007-02-07 at the Wayback Machine USDA Handbook 18. Chapter 3. ^ BS 8601:2013 Specification for subsoil and requirements for use. ^ a b "Topsoil . North Carolina Department of Agriculture(July, 1995)" (PDF). ncagr.gov. ^ "Summary Report, 2007 Natural Resources Inventory". Natural Resources Conservation Services, U. S. Department of Agriculture. December 2009. p. 97. ^ James Smolka (May 1, 2001). "Eating Locally". Discover. Retrieved May 1, 2001. ^ a b "Only 60 Years of Farming Left If Soil Degradation Continues". Scientific American. December 5, 2014. ^ "What If the World's Soil Runs Out?". Time. December 14, 2012. ^ "Topsoil Delivery Topsoil Dirt Cheap ~ Topsoil Delivery". Topsoil Delivery. Retrieved 2017-04-12. Mann, C (2008). "Our Good Earth". National Geographic Magazine. 214 (3): 80–107. Archived from the original on 2013-01-21.